It took me several hours to convince myself, but I finally decided to do it. 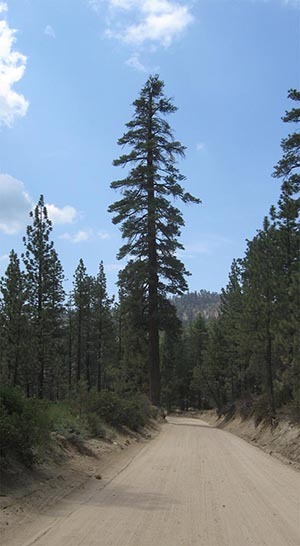 Before I left, I was put in a short trance and given a vision in which I saw what looked like a strange grouping of large ponderosa trees going uphill to a small cabin where there was a Mexican man wearing a huge sombrero and sleeping in siesta fashion against the door post. I looked around the area to take it in, then from the right side a huge grizzly bear ran into the scene and attacked the man. They tumbled down the hill in a fight. Not knowing what to think, I sat down and just took it all in. This place was just beautiful. I had listened to God and was taken to the exact place I had been shown in the vision. Then it sank in. He gave me something much more valuable than gold and silver, the assurance that the voice I was listening to was God. So, after a while, I turned and walked over to the trees and just admired them. I could see my car down the hill behind an aspen grove. I had a good laugh with God and then went back to my car. From there I could see the road and knew exactly where I needed to go. I haven’t been the same since. Ever since that day, I have not been afraid to constantly ask God for directions. Times are going to get tough, but God will provide. Just as he had me drive to a place not normally accessible by car, God will make a way where there appears to be no way. He can make a road in the wilderness, available only to His bride. By following His instructions exactly, we arrive in the exact place where He wants us to be. Along the way, He gives us His rest and talks to us about His plans. If these things are true, then we never need to fret about anything because God is completely in charge. 5 “Then you will see and be radiant, and your heart will thrill and rejoice; because the abundance of the sea will be turned to you, the wealth of the nations will come to you. 6 “A multitude of camels will cover you, the young camels of Midian and Ephah; all those from Sheba will come; they will bring gold and frankincense, and will bear good news of the praises of the Lord. Awesome story. my wife had an experience about 15 years ago that she will never forget. She and my 3 young children at the time were in our Suburban on the Coronado bridge in San Diego. She is afraid of heights so this made her anxious. It was pouring rain and as she was going over the bridge the Suburban lost all electrical power. Our Suburban had 2 batteries. Now she is stuck on the side of a bridge 200′ in the air and it’s poring rain with 3 young kids. Out of nowhere comes a man walking on the bridge pulling a cart with a battery charger. He jump starts the car and as soon as my wife turns to thank him he’s gone. He’s not in front he’s not in back he’s literally vanished. To this day that story still comes up . Years ago while driving my ’78 VW rabbit with my wife and 3 children (winter I believe) the vehicle stopped on the (Edmonton) Whitemud Freeway. We sat in the car on the side of the road but no one stopped to help. After praying, I decided we must get out of the vehicle and as soon as we did 3 vehicles stopped to help. One vehicle took my wife and children to my father-in-laws place, one helped me recharge the battery so I could drive again (the alternator brushes were at fault for not charging,very bad for electronic fuel injection ) and and 3rd vehicle driver we thanked and sent him on his way. I thank GOD for the times I’ve been stranded and he sent people to help me (even in -40 C weather). God works in mysterious ways thats for sure. -40% dude that is cold. He sent you the Holy trinity road side helpers. .
What an awesome testimony! Thanks Ed. I was born again a church camp, I think about 11 years old, but neglected a calling on my life in 1995, told him I needed to stay in control, bad decision!!! Anyway I could hear him like you think thoughts before you say them. But he brought me to a place of surrender, in May of 2009 on May 3rd after much asking he filled me with His Spirit, Wow what a morning that was….. The trip was a few months later in August. Thanks and press in because we all need to with what is coming. God Bless. Bob thank you for sharing, a real encouragement to me. What did you mean trying to discern inner man from the Holy Spirit? What is the inner man? Sometimes I hear things and it brings me peace but then it doesn’t come true. I used to think it the HS as it brought comfort and peace instead of fear or anxiety like the devils whispers. But then when I trusted the peaceful voice and it didn’t come true I stopped listening but perhaps this is inner man you speak of. I’ve never heard that term before so would like to learn so I can discern HS voice too. Expat guy, Its a process, We are incouraged in the word of God to get confirmation, we can also check it against the written word, Words from other people, Presence of the Holy spirit, I call it my inner man because it is our mind will and emotions. Our soul. The Lord told me that though the fire of santifacation, the Word, it would come into agreement with the Spirit. So only stop the voice inside that, seeks to kill steal and destroy. Let the soul have discussion with the Lord. That happened to me too, I thought the Holy Spirit testify something was going to work out but then it didn’t and it really hurt. About 10 years later I figured out that it had been a parable to help me know God loves me. The only way to discern correctly is through that peace. Satan can appear to be wise or intelligent, but he cannot give you that feeling of peace like being wrapped up in a blanket. We need to repent, ask for grace, try again. He will put people in our paths, while we learn to help us even if they are angel and we are unaware. We need to get deep and hidden in the Lord, let him be concerned about our growth. He”ll be faithful even if we are not. Yes lots of times things don’t work out at first but we get the deeper meaning later on, and it is a constant path of repentance and receiving grace. Great sharing. Hope to receive more from you. it is all to glorify Him through our life as citizen of the Kingdom God on earth. 1) Did HE bring you to total surrender BEFORE the Baptism of the Holy Spirit, or after the Baptism? 2) How long did you seek the Baptism before receiving it? 3) Did any man of God or fellow believers lay hand on you, pray for/with you, agree in spirit with you on that Glorious morning? Did you seek it all by yourself? 4) Did you speak in tongues of the Holy Spirit before, during, or in a day or two/week(s) after the Baptism? 5) Did you do anything special (e.g. locking yourself up and decided not to get out till you’ve received, praying & fasting for 40 days, reading a special book/scriptures, listening to anointed sermons, reciting scriptures, etc) to speed up the receiving process? During the waiting period, did you constantly “wrestling with God like Jacob”, or just waited quietly for hours… Did you give up, and restart the whole process? How did you hold up your expectation while waiting, not fallen asleep/distracted? Wow Ming. Yes he brought me to total surrender 1st, I told him it it looked like I was more cursed than blessed. He told me if I would give myself completely to him, he would be to me the supernatural God of the bible”paraphrased”, then I started seeking him for the baptism, I read Luke 11 verse 13. If you being evil parents know how to give good gifts to your children, how much more would your Father in heaven give the Holy spirit to those who ask and keep asking. This started a two week pursuit of Him, I think about two days before he came to baptise me, I siad to him Lord if we recieve by faith then right now I recieve speaking in tonques, so I spoke out a full sentence in tonques, never having heard them. So I repeated that sentence several times. When He came to me to give me the blessing. He woke me up with a great rush of noise in the middle of the night, it was like a body length pillow bouncing off me repeatedly. I heard in my spirit test the spirits. so I asked in the spirit, who sent you. He said the risen Lord. I said come and the rest was awesome. When I was being filled I blurted out in a different tonque. It is not one I have ever heard. I had sought Him through so called spirit filled churches. They wanted me to come to classes. Ming he knows all of or thougts before we think them, he know our heart, our motives. Just be honest with Him and go for Him He’ll show up if your really intent on Him. Awesome story I know that area well.Thank you Lord for keeping Gary Lee and his family safe. Praise Jesus. When I read this, I immediately loved it. Not for the treasure, but your honesty, and your willingness to follow the Lord. This testimony has done volumes for me, thank you! Bob thank you for an encouraging word from God. Hearing His voice is paramount – paramount to our proper growth and maintenance of His testimony. God often teaches us spiritual realities by using life’s everyday common examples. As newborn babies learner their native language by repeatedly hearing their parents voice, so it is with God’s own children. By allowing God to speak to us every day through His Word we too learn a new language – a Divine language. TO KNOW GODS VOICE, WE MUST ABIDE IN GODS WORD. Amen and ask him to give us a hunger for all that his inheritance provides. Now that was certainly and interesting story of guidance. I have heard the voice for God speak to me that came as thunder from all directions and from nowhere. I have had the same experience, drive here, turn there, stop, this house etc. It is an amazing experience. God is amazing, and he loves to do new things and in new ways. Keep listening Russell. We all need to know his voice, because the ememy want us to give up. Will much appreciate if you would share with us how you’ve started & continue the journey/adventure of hearing & distinguishing HIS still small Voice. Let’s start from your born again experience, the baby steps to hearing God, up to this mind-blowing trip with Him. Thanks & have a Merry X’mas! One baby step – long ago I was convicted of saying or writing “X-mas”. Christ is taken out of so much these days that anything we can do to keep Christ in our world, the better, especially at Christmas. Blessings hun! But I am totally with you on the rest. sometimes I wonder what I am hearing, yet I have had several distinct times where I have heard his voice, and advice in this area is appreciated. When I get a word of knowlage about a person, I’ll ask do you have a problem with thus and such? most time it is from the Lord and he wants to Love on or heal, or just encourage. Other times I ask the Lord for confirmation and I’ll see something in the spirit, not unlike a breif vision about them. then I go with what I heard or saw. The Lord is a great ice breaker. He also gives us grace while we are learning to hear, whether a dream, vision, word, knowing, Holy spirit is the teacher. Just have faith and trust. Same here on the “X-mas” topic…….CHRISTmas! See my non attached reply. This is the best story/experience ever!!! I’m looking forward to experiencing this in times to come! What a blessing and fun experience this must have been! God bless you and thank you for sharing it with us! I have been blessed with lots of inspired questions to ask him, and out of those have come many experiences. I believe the scripture is you have not because you ask not. Thank you Bob for sharing this amazing Holy Spirit led treasure hunt that you experienced. I like the point God made that we need him both going and coming. I pray that i listen and obey like you do.